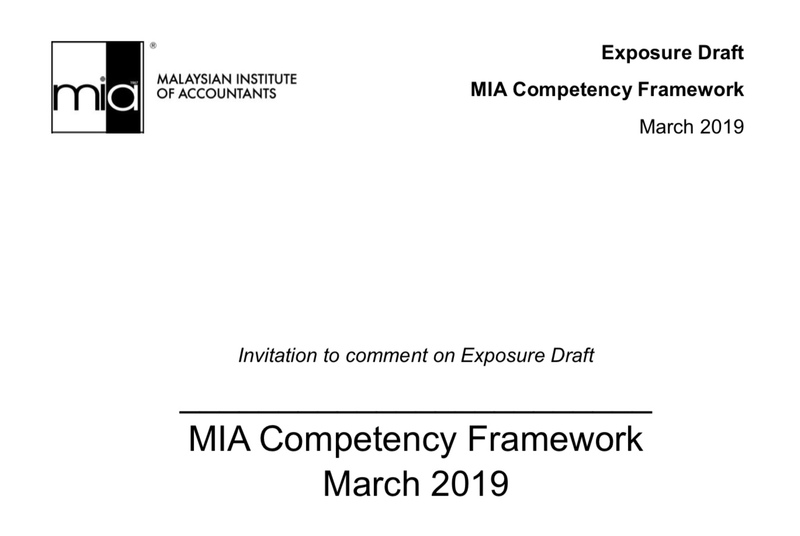 The Malaysian Institute of Accountants (MIA) this month had issued a draft competency framework for public exposure and comments. Based on my recollection, this is the first time MIA attempts to develop a formal and structured competency framework to ensure accountants who are registered with MIA are able to perform and deliver professional services to their employers and clients. In coming up with the proposed competency framework, MIA took into considerations the recommendations of the Committee to Strengthen the Accountancy Profession (CSAP) and the Report on Observation of Standards and Codes for Accounting and Audit which was conducted by the World Bank in 2012. It engaged the Accounting & Audit Research Consultants to draft the framework (MIA CFM). According to MIA "The MIA CFM is a set of principles that defines the baseline competencies and skill sets required to become accountancy professionals who are able to demonstrate their proficiency at different levels namely “Foundation”, “Intermediate, and “Advanced” as defined by the framework issued by the International Accounting Education Standards Board (“IAESB”). The development of MIA CFM helps to assure the market that the title refers to accountancy professionals who have demonstrated the achievements of the baseline competencies required to excel in a specific role". When MIA was established in 1967, it was empowered by the Accountant Act, 1967 to register accountants in Malaysia and to conduct examinations to assess their level of competencies. However, the examination power was never exercised, instead MIA recognised those who are members of professional accountancy bodies to be registered with MIA as Registered Accountants and Public Accountants. In early 70's, graduates from recognised institutions of higher learning started to be recognised for registration as well. The reasons for the inclusion of these graduates were never properly documented and remains as a contentious issue until today as this is not practiced in economies where the accountancy profession is considered matured. What makes this issue worse is when most of the graduates of the recognised university qualifications are given partial exemptions by various professional accountancy bodies, sending a signal to the market that they are not equal. These graduates would need to sit for additional professional papers before given full membership. In 2000, the Accountant Act was amended to abolish the examination power of MIA and those registered with MIA are known as Chartered Accountants. This created a perception which is different from the original intention of the law. Other than MIA, I am not aware of any other bodies which refers to their registrants as Chartered Accountants, without a proper professional assessment. While the exposure draft on MIA CFM focuses on the competencies of the three levels of membership as proposed, we as the stakeholders in the industry, should also consider the whole membership framework to ensure it is robust enough to produce accountants as envisaged in the MIA CFM. Malaysia had been benefiting from the services of accountants trained by various professional accountancy bodies from Commonwealth countries which are recognised here. These bodies do not only train our accountants to achieve their baseline competencies but those competencies were regularly reviewed to ensure they meet the demands in the various markets they serve. This is very important as not only we get our accountants to be close to the curve but their perspectives and specialisations provided huge value to our companies and institutions which need to compete with global peers and competitors. It would be unfortunate if this arrangement is made more difficult due to pressure from interested groups within the accountancy profession. I really hope that market participants and industry players would take this opportunity to provide feedbacks and expectations for MIA to seriously consider. It is important to note that the reason MIA exists is to be the guardian of professional standards through registration. This is a statutory requirement which requires MIA to place public interests ahead of any sectoral interests within the accountancy profession. MIA should not abdicate this responsibility. The exposure period ends 10 May 2019.